Preheat the oven to 350 degrees. Line an 8×8 baking dish with foil, spray with baking spray. Set aside. Add the flour, salt, and cocoa powder. Mix until fully combined and mixture is smooth. Bake for about 12-15 minutes until the brownies are mostly set. While the brownies are baking prepare the cheesecake mixture. In a medium size bowl beat the cream cheese until creamy. Add in the sugar, egg and vanilla extract. Mix on high speed until mixture is smooth and creamy, no lumps. Spoon the cheesecake mixture on top of the pre-cooked brownies and carefully smooth out with a rubber spatula. If you spread it too roughly you will tear up the brownies underneath. Once the cheesecake layer is smoothed out, spoon the strawberry sauce or jam on top. Using a butter knife gently swirl. 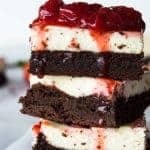 (if using the strawberry sauce you will want to pour it through a strainer to use just the sauce portion, then add the remaining sauce back to the berries to spoon on top of finished brownies). Return the pan to the oven and continue baking for another 20 minutes. Allow the brownies to cool for about 20 minutes on the counter, then place the pan in the fridge and allow to cool for another 2-3 hours prior to cutting.